From the simple assertion that "words matter" in the study of visual art, this comprehensive but eminently readable volume gathers an extraordinary selection of words—painters and sculptors writing in their diaries, critics responding to a sensational exhibition, groups of artists issuing stylistic manifestos, and poets reflecting on particular works of art. Along with a broad array of canonical texts, Sarah Burns and John Davis have assembled an astonishing variety of unknown, little known, or undervalued documents to convey the story of American art through the many voices of its contemporary practitioners, consumers, and commentators. American Art to 1900 highlights such critically important themes as women artists, African American representation and expression, regional and itinerant artists, Native Americans and the frontier, popular culture and vernacular imagery, institutional history, and more. 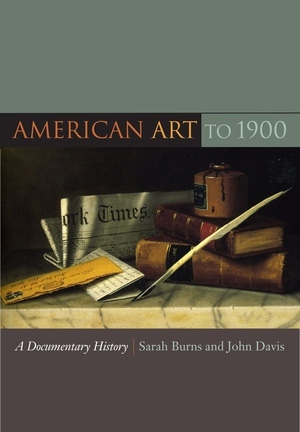 With its hundreds of explanatory headnotes providing essential context and guidance to readers, this book reveals the documentary riches of American art and its many intersecting histories in unprecedented breadth, depth, and detail. Sarah Burns is Ruth N. Halls Professor of Fine Arts at Indiana University. She is the author of Painting the Dark Side: Art and the Gothic Imagination in Nineteenth-Century America (UC Press), Inventing the Modern Artist: Art and Culture in Gilded Age America, and Pastoral Inventions: Rural Life in Nineteenth-Century American Art and Culture. John Davis is Alice Pratt Brown Professor of Art at Smith College. He is the author of The Landscape of Belief: Encountering the Holy Land in Nineteenth-Century American Art and Culture. What Does Art Teach Us? Is Religious Art Still Relevant? Anthony Comstock vs. Knoedler & Co. The Nation vs. Prang & Co.